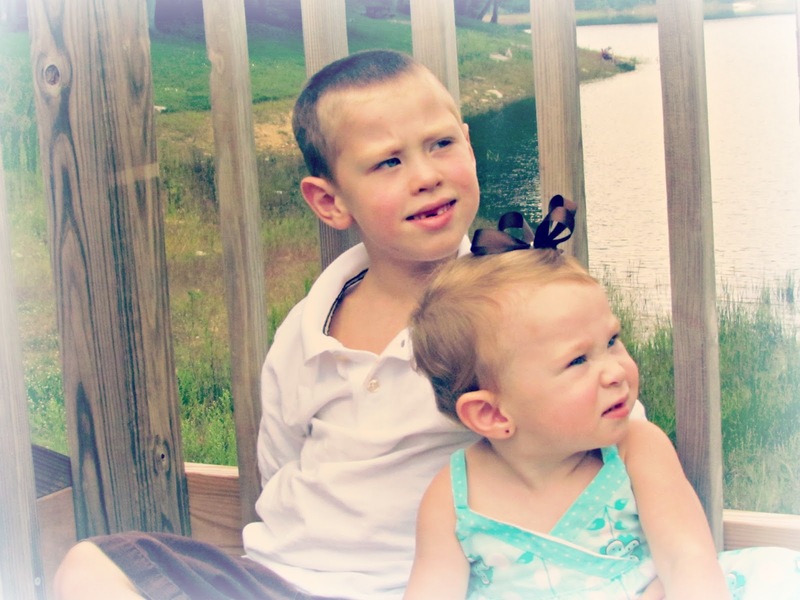 Brittany Marshall, today's guest Fragile X Writer, is leader of the Fragile X Families of the Appalachians located in Tennessee, a blogger at X Marks the Spot, and first and foremost, a mom - to a sweet little boy with Fragile X Syndrome named Dalton, and his sister, Payson. Brittany's not long into her journey, and yet has accomplished much in such a short time. Not really one for public speaking or writing, the Fragile X diagnosis has inspired her to reach out to both give and get support. She is so relatable - you'll find yourself nodding along to what she has to say. Right before Dalton turned two years old, I started questioning his pediatrician about why he wasn't talking more, of course the answer I got was "He is a boy, and boys are always slower." I heard this A LOT. Dalton sat up, crawled, and walked at the right times. He even said "bye bye" and "da-da" at the appropriate age. But then the language never moved beyond that. So, at two, when his pediatrician didn't want to act, we changed doctors. Dalton had had numerous ear infections up to this point. His new pediatrician referred us to an ENT and early intervention services. He got tubes shortly thereafter which pretty much eliminated the ear infections . But it took a few months for the speech therapy to begin. Once it did and we started teaching him sign language, he caught on and progressed pretty quickly. At that time Dalton didn't have any other behaviors that we could pinpoint to make us believe something besides Apraxia of Speech was going on. But, when he quit receiving services his progress stalled, and we started to notice other behaviors (little eye contact, hyperness, and his fine motor skills were slightly behind) developing; or maybe they just got worse, or maybe I was just ready to admit them. So we waited about six months after he aged out of early intervention services before we entered the school system. When we started with the school system they did all their initial testing and they diagnosed him with autism and being about two to two and a half years behind in pretty much everything. I remember sitting in a room with 4 or 5 school representatives listening to their words, holding back tears and just praying they would end the meeting quickly before I lost it. 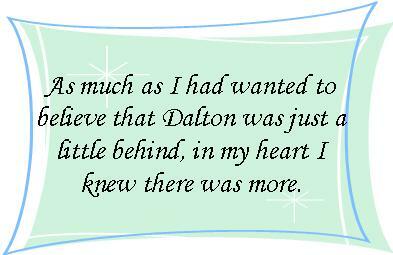 As much as I had wanted to believe that Dalton was just a little behind, in my heart I knew there was more. I had been questioning doctors for two years without any answers. I guess it was hearing someone else say what I had feared. But, at the same time Dalton didn't fit all the categories for autism and these women had only spent a few hours with him. So needless to say, even though I was heartbroken, I wasn't completely convinced they were right. Dalton was so loving and interactive with our family. He desired the interactions, more importantly. By this point we were on our 4th pediatrician and before we had even finished the school's evaluating process I had told him I wanted Dalton to be evaluated somewhere else. We were sent to Cincinnati Children's Hospital. It took several months before we were able to get an appointment. Our first appointment was in January 2012 where we were told that they would be doing the ADOS again to test for autism and that they also wanted to do some genetic testing. On January 19th, one day before my husband and my five-year-anniversary and one month before Dalton's 4th birthday, we received our Fragile X diagnosis. And a new journey began. Getting our diagnosis was just the first step to get us on the right road with at least some idea of what was going on. In July we attended the International Fragile X Conference in Miami. It was wonderful to meet other families who had been there, done that, or were currently going through it. The conference gave us resources and a hope that we weren't sure of before. In October we started the Fragile X Families of the Appalachians, our LINKS group. I wanted so badly local families to have somewhere to turn to. I am sure our journey will be long and full of obstacles. However, God put this in our lives for a reason. Dalton's diagnosis may have shut doors I was positive we would travel through, but it has opened many other ones I wouldn't have dared to even peek in before.